Leprosy - Shanti Leprahilfe Dortmund e.V. If leprosy is not treated in a timely manner, it attacks the extremities. 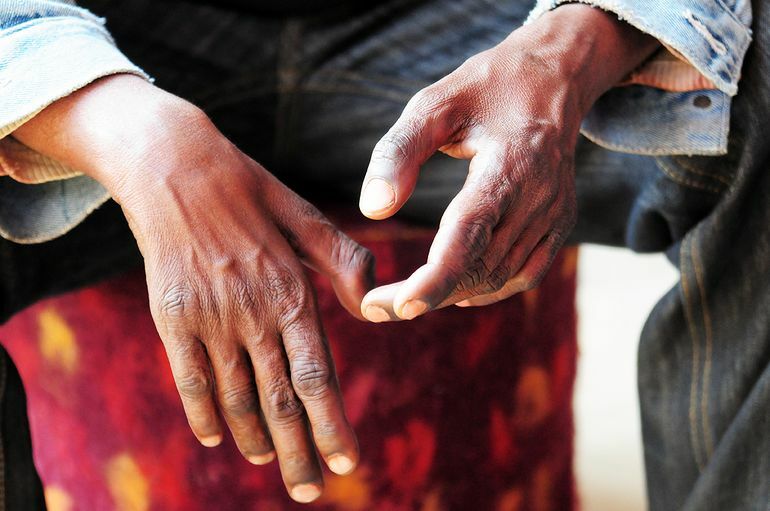 Many who have been cured of leprosy are still left with disfigured hands and feet. 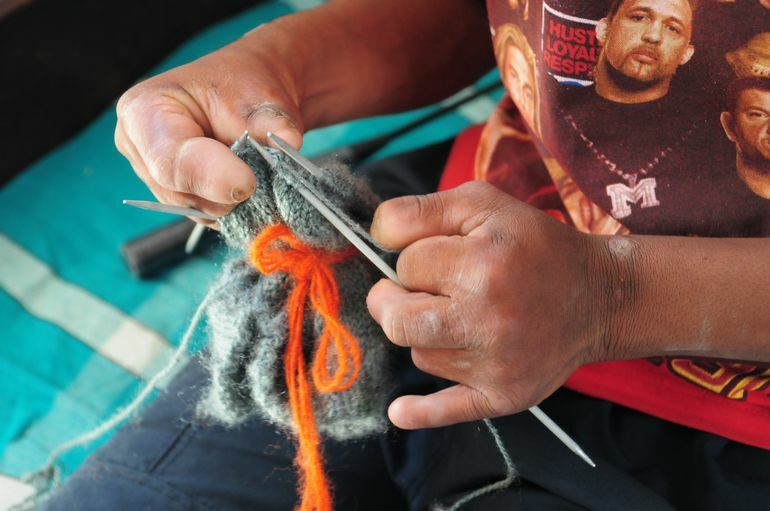 Nevertheless, they can still do incredible handicrafts, such as knitting. The whitish strips on the upper arm were the first symptoms of leprosy infection. 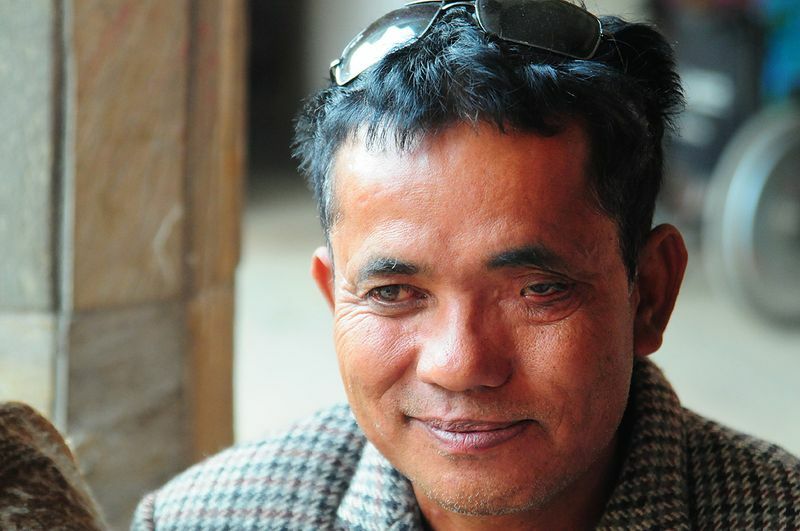 Hari Chaudhari's left eye was affected by leprosy and has required several operations. Leprosy caused this woman's nasal bone to break off (right). She rediscovered a sense of self-confidence at Shanti. 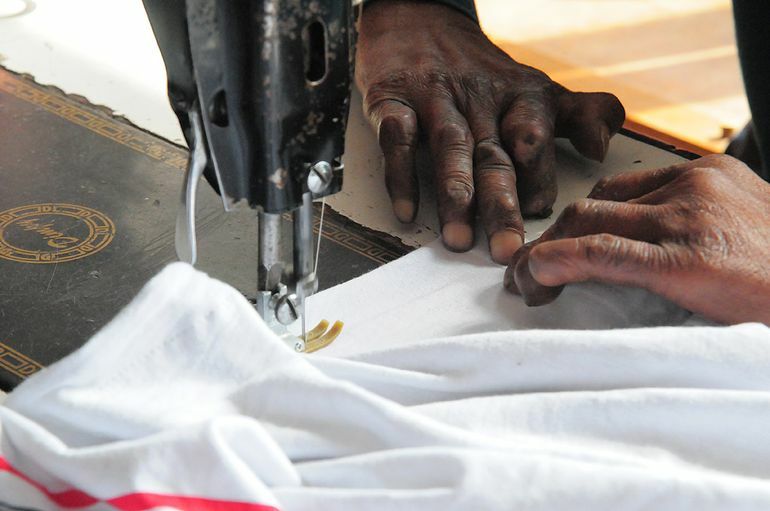 Even these hands can sew wonderful shirts – and the stitched cords run perfectly parallel to one another! 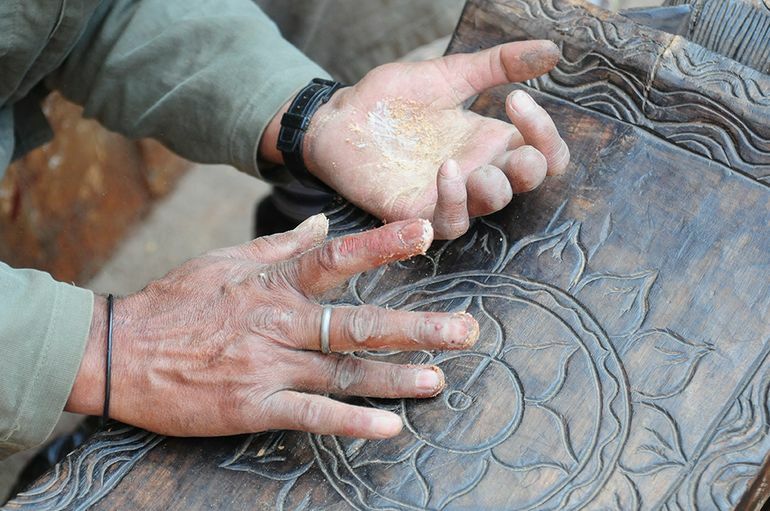 This carpenter's left hand was heavily disfigured by leprosy – but he can still work well with it. Nathuni also required multiple eye surgeries in order to avoid going blind. Despite disfigured fingers from leprosy, Jogendra can still do wonderful painting! Leprosy is a contagious disease caused by bacteria (Mycobaterium leprae) that primarily affects the skin, mucous membranes and nerves. Historically, lepers were isolated from society due to the threat of contagion. In Kathmandu and many other Asian cities there were actual leper ghettos, where the ill wasted away under the most miserable conditions. 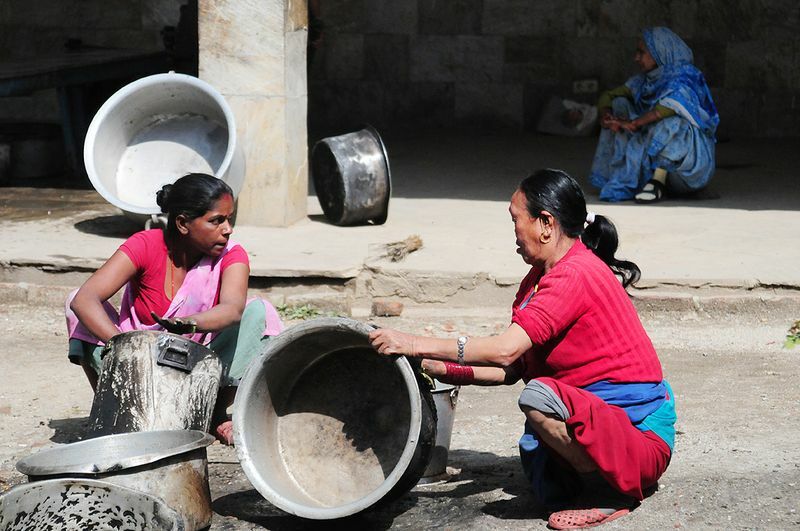 The scarce availability of medical care is the reason why there are still so many leprosy cases in Nepal. There are only a few leprosy stations in the country that offer free treatment – and the ill have to reach these first. 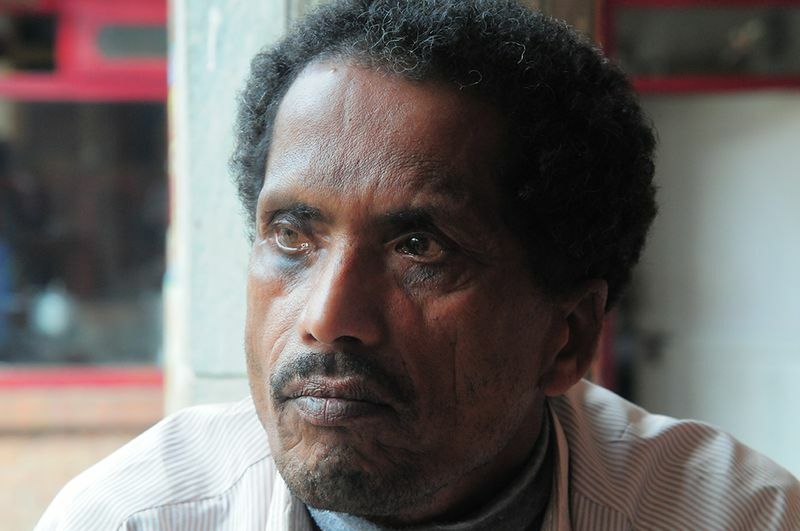 As is to be expected, the routes are arduous – especially in the mountain regions – and poverty also contributes to the fact that leprosy sufferers do not get the help they need (as well as other sick people). Leprosy is an airborne infection. The threat of infection depends on the hygienic conditions and the stability of the immune system. If the body's natural defences are already weakened by poor living conditions or malnutrition, then it is easier for the leprosy bacteria to take hold. The first symptoms are light spots or stripes that run along the skin, frequently on the arms. The skin loses sensation at these points and becomes numb. As a result, injuries, heat, cold and pain can no longer be perceived. Other disease germs can enter the body through open skin wounds and cause severe infections and inflammation. They destroy the tissue and frequently the bones as well. In the worst cases, fingers, toes and even whole limbs must be amputated. Because the tendons shrink over the course of the disease, the fingers become gnarled and result in so-called “claw hands”. The eyes are also affected frequently. The lower eyelid droops due to nerve damage. It becomes loose and hangs down. As a result, the cornea and conjunctiva are no longer coated by tears; instead, the eye waters constantly and the surface of the eye dries out. In addition, the eye is no longer covered while sleeping. Mosquitoes can then prey on the eye surface and transfer bacteria. In turn, this leads to painful infections and ulcers that result in even more damage to the cornea until it is so badly damaged that the eye goes blind. For this reason, the lower eyelid must be tightened through surgery as quickly as possible if it begins to droop. Shanti residents are operated on in the highly qualified eye clinic directly adjacent to the leprosy station; it is not unusual that several surgeries are required in order to protect the eye. 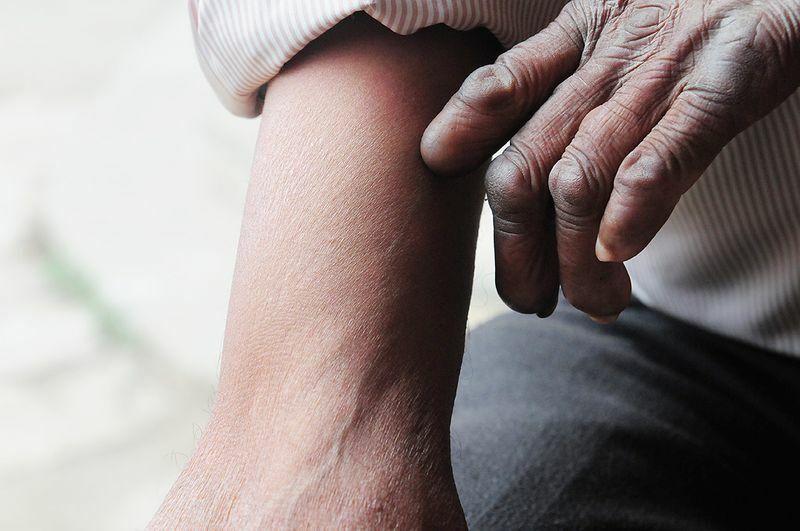 If leprosy is treated with antibiotics, then the ill are no longer contagious, but often marked for life. They are cast out of their families and villages; in Nepal illness and disability is considered a punishment from the gods. According to Hindu beliefs, coming into contact with these people can be damaging for the next reincarnation. For this reason, most sick and disables people are homeless and must beg at the temples and other public places. Helping people out of these miserable conditions was a major reason why Shanti Leprahilfe was founded.